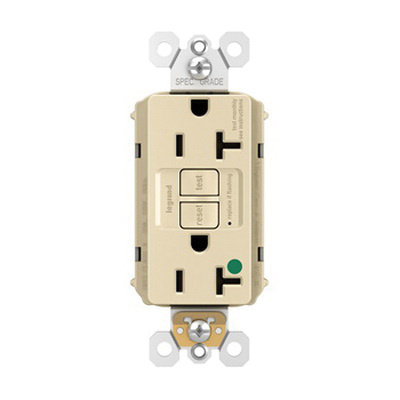 Pass & Seymour 2-Pole 3-Wire Self-test GFCI duplex receptacle in ivory color, has voltage rating of 125-Volt AC and current rating of 20-Amps at 60-Hz. It has short-circuit current rating of 10-Kilo-Amps. 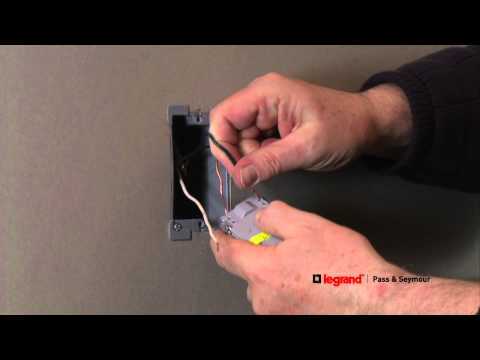 The hospital grade receptacle accommodates #12-AWG conductor. It has nylon body and face. It features high-impact-resistant thermoplastic construction. It measures 4.2-Inch x 1.72-Inch x 1.2-Inch. The receptacle withstands dielectric strength of 1500-Volts. It has brass contact for optimal conductivity and zinc-plated steel strap. It withstands temperature range of -35 to 66 deg C.
The self-grounding receptacle has NEMA 5-20R configuration. It is suitable for use in industrial, healthcare, education, institutional, retail, office, hospitality/lodging, multiple dwelling applications. The receptacle is screw mountable. It has V-2 per UL94 flammability rating to withstand harsh environmental conditions. It has built-in connector for reliable electrical connections. It features auto-ground clip that assures a positive ground to metal box. It comes with matching TP wallplate. Self-test GFCI duplex receptacle is UL listed.